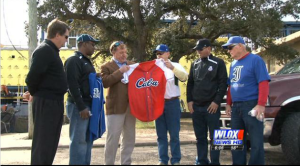 BILOXI, MS (WLOX) – A baseball delegation from Cuba took a tour of the new MGM ballpark in downtown Biloxi on Friday morning. 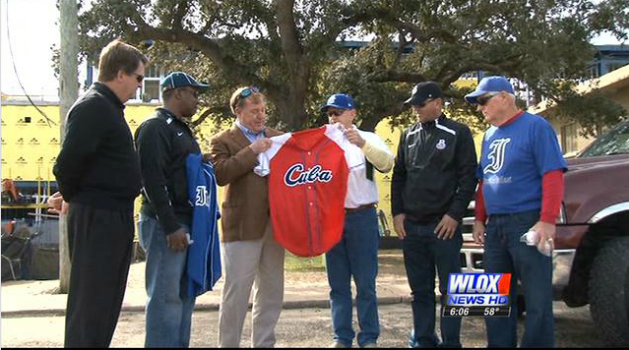 The visitors are on the Mississippi Gulf Coast to discuss plans for an exhibition game in Biloxi, featuring a baseball team from Cuba. “On behalf of the city here, City of Biloxi, and this is my ward, ward two, we welcome you,” said Biloxi Mayor Pro Tem, Felix Gines, as he welcomed the delegation. Following his greeting, members of the visiting Cuban delegation got a close-up look at the construction of MGM Park. “I like it very much. I’m very impressed,” said Eduardo Ortero. Ortero is excited about the possibility of the Cuban team, the Industriales, displaying their baseball skills in America. “Because right now, it fit in all levels. Political, sport, cultural, and it’s going to be a good experience for the Cuban teams,” Ortero explained. Biloxi Shuckers co-owner, Tim Bennett, envisions an international tournament at the ballpark late this year, featuring not only Cuba, but other teams from around the world. “Mississippi is known as the birthplace of America’s music. Music is international and so is baseball. This is just a great opportunity I think for the community and for the State of Mississippi to widen its borders,” said Bennett. Those involved with these negotiations say with the President’s talk of lifting the trade embargo with Cuba and lessening restrictions between the two countries, the timing of this baseball project couldn’t be better. Bennett says he envisions an international baseball tournament, with teams from around the world playing in Biloxi. There are still plenty of details to work out, but both groups say they’re confident the plan will come together.